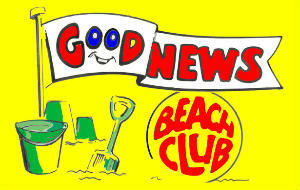 Welcome to the Good News Beach Club page. The Beach Club is FREE for all children. Just come along and join in. No charge, no registration. We just ask that children’s parents/carers stay within sight while their children are at Beach Club. The Beach Club is held on Skegness beach during the third week of August. Good News Beach Club is intended to entertain, teach and present the Christian message to children and adults who live, or are holidaying in Skegness. The team leading Good News Beach Club are all volunteers who give up their holidays to come to Skegness because as committed Christians we believe that the message of Jesus is important and relevant to everyone today. Some of the team members work with children as teachers or pre-school workers; others earn their living in other ways. All are regular workers in their own churches. The Beach club is run in association with St Paul’s Baptist Church, Skegness and is organised by Hasbury Christian Fellowship. Good News Beach Club will be running 12th – 16th August 2019. If you would like more information, complete the form below and we’ll get back to you as soon as possible.